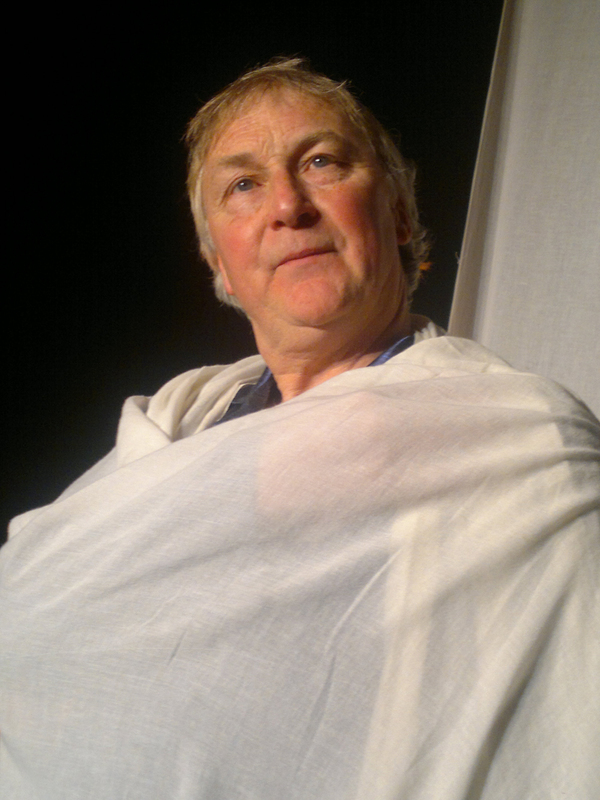 With a hanging white sheet the only stage prop but with immense versatility of expression, body movement and voice, Donal O’Kelly mesmerized his audience at An Grianan theater in Letterkenny last week as he enacted ‘Catalpa,’ about the rescue of Fenian prisoners from the British colony of Australia in 1865. In a riveting 90-minute show, O’Kelly – who also wrote the script – plays a wide array of characters such as George, a whaling captain; Greta, his wife; a French maid; Mister Richardson, a brusque shipping agent, as well as a ghost – many of them in different accents ranging from Irish to Scottish and American. 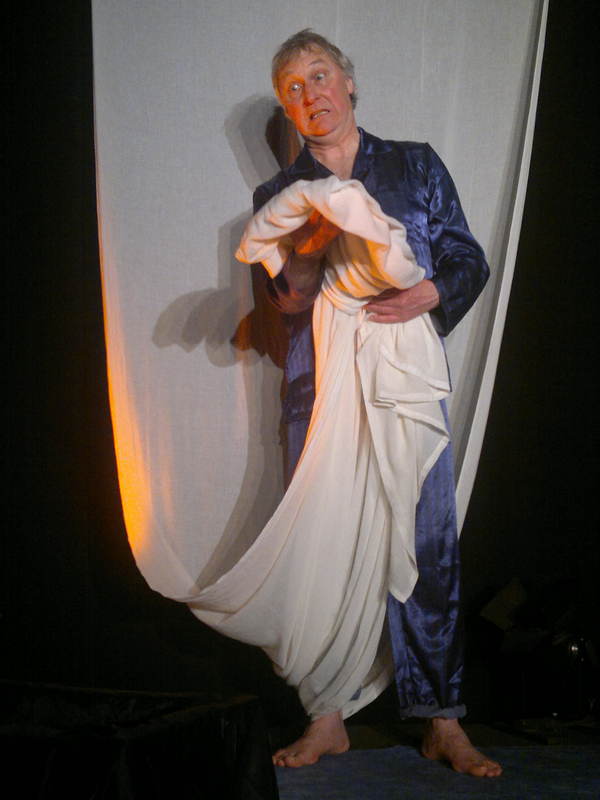 He also skillfully voices various inanimate sounds, and creatures, including a seagull and a whale and by draping the sheet around his shoulders also accomplishes a fleeting but imposing impression of the Statute of Liberty. His comical impersonation of Breslin, a recalcitrant Irishman, raised more than a few chuckles of delight. O’Kelly, who has honed his performance brilliantly in the 20 years since he first performed his one-man show, is ably supported by musician on stage, Trevor Knight, whose arrangements provide seamless mood accompaniment. Kudos also go to technical manager, Ray Duffy, who parlays his dexterity on the lighting console to create a key additional dimension through interplay of illumination and shadow. Dressed in dark blue pajamas, O’Kelly opens the play as the narrator getting ready for bed and chiding himself for failing to persuade Hollywood agents earlier that day to shoot a film based on the historic rescue of the six prisoners and their safe passage to New York on a whaling ship. He then launches into the whole story, combining the voices of diverse characters with atmospheric sounds and impressive facial expressions as the plot slowly unfolds. 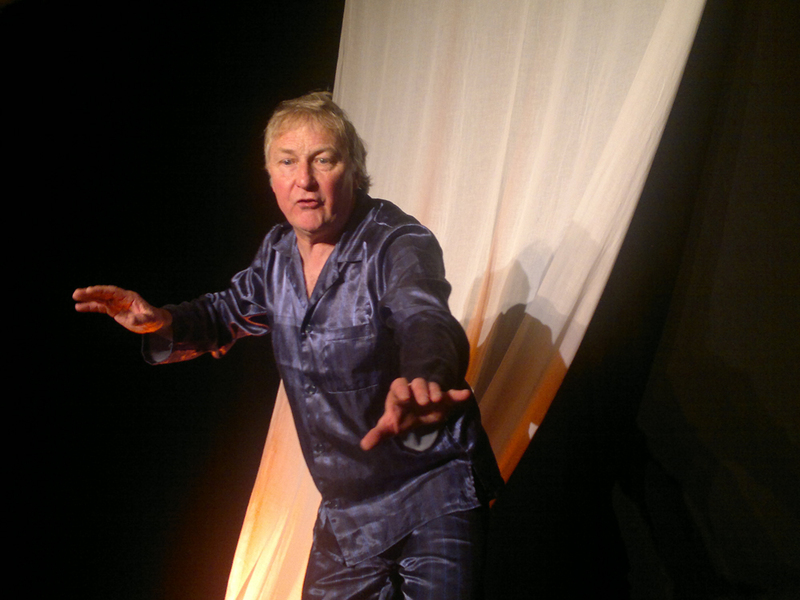 Interestingly, O’Kelly also provides a unique perspective from on high through his excellent impression of a seagull, a recurring motif throughout the play. It is obvious this fine actor must have analyzed the flying habits of that particular feathered species in great detail as the way in which stretches out his arms and flaps them in a peculiar motion is highly convincing. His mouthing of various sounds is also quite remarkable, ranging from the hollow vibrations emanating from a seabed and the clip-cop of horses’ hooves to oars swishing the surface of water and even the clink and jangle of manacles in the hold of a ship. And to cap it all, O’Kelly also manages to regale the audience with a verse or two. The event proved to be a delightful evening of theatre, one well worth seeing. All credit goes to the team at An Grianan for bringing the show to Donegal, one of up to 200 events a year across different art forms it hosts. In terms of performing arts in Letterkenny, located in Ireland’s most northerly county, McBride considers it, “exceptional in its venues for a town of its size,” adding, “We have a purpose-build theatre which specializes in the performing arts and a purpose-built arts centre which focuses on the visual arts and niche music events.” Both venues also have a strong participative arts programme of workshops and classes. Future shows at the 383-seat An Grianan, opened in 1999, range from the production of ‘It’s The Real McCoy’ written by Tommy Marren’s and performed by the Crokey Hill Players; next week’s ‘The Shakespeare Sessions,’ an innovative take on the works of the Stratford Bard hosted by Cyclone Rep, a theater-in-education arts group; ‘A Portrait of the Artist as a Young Man’ in March by the New Theatre Dublin in association with Richard Ryan Promotions; and the Opera Theatre Company’s new production of ‘Rigoletto’ in May. Posted in Arts & EntertainmentTagged Abbey Theater, Abbey Theatre, American, An Grianan, Australia, British, Catalpa, Clokey Hill Players, colony, Donal O'Kelly, Donegal, Druid Theatre Company, Fenian, Ireland, Letterkenny, Nasc, Nomad, Patricia McBride, Ray Duffy, theater, theatre, Tommy Marren, Trevor KnightBookmark the permalink.